Uncover the highlights of the 'Pearl of the Indian Ocean' at a relaxed pace. This two week exploration of spiritual Sri Lanka features a mix of ancient cities, rock carvings, gilded Buddhist temples and wildlife-filled national parks. Kandy and the Hill Country - Explore the 'temple of the Tooth' and the lush tea plantations in cooler climates. A three-hour drive north takes us to Wilpattu National Park. En route, we will visit a nearby fishing village which uses traditional-style outrigger canoes, known as 'oruvas'. Along the way we hope to spot the toddy tappers climbing tall coconut trees to collect sap from the flowers. This is used to make Arak - a local whisky-type spirit. Despite the park's location in Sri Lanka's dry zone, it boasts nearly 60 lakes and is renowned for leopard, elephant and sambar deer spottings. We will go on a jeep safari in the hope of spotting the elusive leopard. We choose to visit this park, rather than the more touristy Yala National Park further south because we believe it offers our customers a better experience. The same animals can be seen here as in Yala, however it is less crowded, making our visit more enjoyable and responsible. Leaving the park, we drive to nearby Anuradapura, where we will spend the next two nights. This morning, we explore the ancient capital of Anuradhapura - a UNESCO World Heritage Site famous for its well-preserved ancient ruins. One of the oldest continually inhabited cities in the world, it was founded around 500 BC. Its golden age began around 260BC, when the King and his people converted to Buddhism. The city became vast, spreading over many miles. There were hospitals for the sick, hostels for travellers and artificial reservoirs to ensure a good water supply. Of great interest are the 2,200 year-old Sacred Bo-Tree; the Brazen Palace, once a nine storey residence for monks; the 4th century Smadhi Buddha masterpiece and the Ruvanvalisaya Dagoba - a 90 metre-high dome-shaped shrine towering over the surrounding countryside. In the afternoon, we travel eight miles to the mountain peak of Mihintale. It is believed that this was the site of a momentous meeting between the monk Mahinda and King Devanampiyatissa, introducing Buddhism to the country. Exploring Mihintale involves climbing a flight of 1,840 shallow stone steps, and a short final section with uneven steps and a hand rail leading to the summit of the Missaka Mountain. There are excellent views from the top looking back to Anuradhapura. Travelling towards Giritale, we pause to view the magnificent Standing Buddha of Aukana, which stands 12 metres high. Sculptured in the 5th century by a master craftsman, it is still relatively isolated in its jungle setting. Our next stop is Dambulla, where a great series of caves have been turned into temples dating from the 1st century BC. This World Heritage Site still attracts scores of worshippers. We will visit five separate caves, which contain a large number of Buddha images and a few sculptures of Hindu Gods. After enjoying a traditional Sri Lankan lunch of 'rice and curry', we reach the small town of Giritale - our base from which to explore Polonnaruwa. Our hotel for the night looks out over a large and picturesque 7th century man-made lake. This morning we explore the ancient city of Polonnaruwa, which reached its height of glory in the 12th century, when it was a thriving commercial and religious centre. The city still maintains many of its spectacular buildings and monuments, with arguably the most impressive being the Quadrangle. This sacred precinct originally housed the tooth relic. It contains a superbly decorated circular shrine which is one of the most ornate buildings in the country. The neighbouring audience hall and bathing pool are also worth a visit. Close by, the curious round structure of the Circular Relic House has a beautifully preserved moonstone carved at the foot of a flight of steps. Another famous feature of this deserted city is the group of carved images of the Buddha, known as Galvihara. These four colossal figures are all hewn out of solid granite and the Reclining Buddha alone is no less than 14 metres long . After we continue with a drive towards out accommodation for the night. In the early afternoon, we have the option to take a jeep safari in either Minneriya or Kadaula National Park (depending on the season), where we can search for herds of wild elephant. Your Explore Leader will be able to advise you of the likelihood of good elephant sightings at the time you are in the area. The parks are also home to a large array of birdlife, including painted storks. An early start this morning as we plan to climb Sigiriya Rock ahead of the crowds and whilst it is cool. The ruins of this 5th century 'Sky Fortress' are one of Sri Lanka's major attractions, a stupendous sight to behold and a feat of consummate engineering skill. Built in just seven years as a fortified palace to protect the reign of merciless King Kassapa, who had assassinated his father and deposed his brother, it is seen as one of the world's best preserved examples of ancient urban planning. Unfortunately for the king, despite its impregnable reputation, he was defeated here by his brother after a reign of just 18 years. A switchback series of steps and steel stairways ascend to the top. Halfway up, tucked beneath a sheltering overhang of rock, are the famous frescoes - the Sigiriya Damsels, their colours still glowing. Before our final ascent to the summit, we pass between a set of enormous lion paws carved out of the rock - all that remain of an ancient gateway that gave Sigiriya, the 'Lion Rock', its name. Once at the 200 meter summit, magnificent views can be enjoyed of the surrounding jungle and countryside. This afternoon, a two-hour drive takes us to Kandy. En route, we stop to visit the woodcarving centre at Naula and a spice garden. Sitting on a plateau 500 metres above sea level and 112km northeast of Colombo, Kandy is, in climatic and cultural terms, a world apart from Colombo. Serving as the capital of the last Sinhalese kingdom until falling to the British in 1815, it is a place of cultural and spiritual importance. Buddhists from all over the world come here specifically to visit the Temple of the Tooth, the Dalada Maligawa. The costly jewelled shrine of the Holy Tooth, said to be Buddha's left canine, is kept in the upper floor of the original building. This relic was brought from India 1,500 years ago and every year, at the time of the August full moon, it is paraded round the town with great pomp and circumstance. This morning's sight-seeing includes attending the Temple of the Tooth Ceremony and a visit to the serene Peradeniya Botanical garden. Your afternoon is free to continue your exploration of this delightful old highland town. In the evening, we hope to have the opportunity to watch a performance by the famous Kandyan dancers, admiring their impressive costumes and graceful dances, accompanied by a thundering drum beat. After a free morning, we drive to Dalhousie in the foothills of Adam's Peak. Here, we have the opportunity to ascend this sacred peak, known locally as Sri Pada. A depression at the top of the peak is said to be Buddha's footprint and, each year, thousands climb to the top for sunrise. Shortly after midnight, we join pilgrims for our ascent. There is a stone staircase which we follow right to the top. It can be tough on the legs, and some may find it physically challenging, but you can go at your own pace, take your time and savour the experience. We reach the top in time for sunrise, when spectacular views all around us. For anyone not wanting to climb the peak, there is free time to explore the small town of Dalhousie, or relax at our guesthouse. Returning from the peak early this morning, we enjoy a well-earned breakfast before making our way to picturesque Nuwara Eliya. Known as 'Little England', here we will find red telephone boxes, Victorian colonial architecture and pretty rose gardens - legacies from its era as a hill country retreat for any homesick British. The cool climate provided a sanctuary in which to immerse themselves in familiar pastimes, such as polo, golf and cricket. This part of Sri Lanka is also an important tea growing area and plantations stretch over rolling hills for as far as the eye can see, interspersed with the occasional tea-making factory. We have free time for the rest of the day to explore this colonial treasure. This morning, we make our way to Bandarawela. We have the option to travel by train through beautiful countryside, winding through the mountains on a rail network that was introduced during British Colonial rule and has changed little since. Passing by impressive waterfalls and travelling through lush tea plantation country, we are likely to see colourfully-dressed tea pickers working in groups. The train can be busy and seats are not always available, so it is also possible to travel to Bandarawela by road through similarly impressive scenery. Arriving in Bandarawela late in the afternoon, we have the opportunity to explore the quaint shops of this small, untouristy town, before settling down in our colonial-style hotel for the night. This morning we visit Ravana Ella Falls, one of the widest waterfalls on the island, before continuing south through the hill country until we reach the plains and the small town of Wellawaya. Travelling onwards to Udawalawe National Park, we are likely to spot a 51 foot image of the Buddha known as Colossi of Buduruvagala, rising majestically above us along with other Mahayana statues. Udawalawe, designated a national park in 1972, covers some 31,800 hectares and is surrounded by mountains, a mix of rolling grasslands, teak plantations, rainforest and scrub. Renowned for its large herd of elephants, the park is one of the best places in Sri Lanka to see them, and is also home to deer, wild boar, buffalo, jackal and leopard. The resident bird population is also second to none, including a magnificent collection of birds of prey, chief among them the impressive white-bellied sea eagle. The afternoon is spent exploring the park by jeep and visiting the Elephant Transit Home where orphaned elephants are cared for until they are old enough to be released back in to the wild. Continuing southwards this morning, we descend through a huge region of rice paddies before reaching the coast. We travel through the small fishing port of Tangalle, home to a project supported by the Travel Foundation, where women learn to make traditional Beeralu Lace. Selling the lace helps them to become more self-sufficient. We will visit and learn a little of their craft and support these ladies who lost their breadwinners in the 2004 tsunami. In the afternoon we'll visit the pretty coastal town of Galle passing through Koggala where we may be lucky enough to see the famous stilt fisherman balancing precariously above the ocean. An important trading centre since ancient times, the fortifications that can be seen in Galle today were built by the Portuguese and then the Dutch from the 16th to the 17th centuries. The fort ramparts of this World Heritage Site protect the harbour and a myriad of fascinating old houses, churches and warehouses. Today, the town has a strong arts vibe, with foreign and local artists, writers, photographers, designers and poets drawing inspiration from their surroundings. Boutique shops and cafes around the town showcase their work. There is a lot to explore in the town and simply wandering its streets, soaking up its unique atmosphere is a great way to spend an afternoon. If you feel that you haven't spent enough time here on this afternoon's sightseeing tour, you have the opportunity to come back tomorrow. Today is free to relax on the beaches of Unawatuna, or explore more of nearby Galle. For those seeking pure relaxation, local Ayurvedic massages with natural, aromatic herbal oils are highly recommended. Alternatively, between the months of December and April, you might prefer to go on a whale watching trip in the hope of spotting humpback and blue whales. Take some time to soak up the last few hours on the beach before we journey back to Colombo for our last night- a total travel time of just a couple of hours. Once in the capital we spend the afternoon exploring Sri Lanka's capital city. We'll wander around the historical 'fort' area, now the business district, whose buildings are like a slice through Colombo's colonial history and visit the Pettah neighborhood, famous for its bustling open air bazaars and markets. We will also visit the most important Buddhist temple in the capital, Gangaramaya, which is an oasis of calm in an otherwise frenetic city and end the trip by the Galle Face Green, an urban park along the sea front where locals gather to often play cricket and gather for other daily rituals. Kandy - Cultural Show £5.00. Unawatuna - Boat Excursion to coral reef £5.00. Unawatuna - Whale watching boat trip £60.00. Lightweight shoes and sandals. Whilst in the tea areas you may encounter leeches, you may wish to consider taking leech socks with you. A water bottle is recommended for walks. Although mosquito nets or screens are provided at most nightstops and in spite of fewer mosquitoes due to higher elevation, you may choose to bring your own (attachable with nails and tape) for use here. Alternatively, please bring mosquito coils. Accordingly you should allow approximately £40. 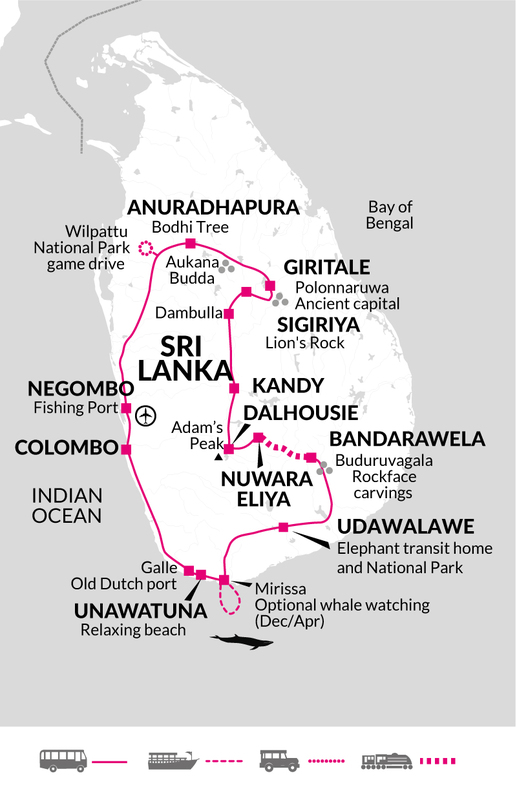 This comprehensive trip of the 'Pearl of the Indian Ocean' covers Sri Lanka's many highlights. Discovering ancient cities, rock carvings and gilded temples, we uncover the island's rich Buddhist history and culture. Other highlights include the spectacular hill country, wildlife-filled national parks and an idyllic tropical coastline where we enjoy some down-time. Along the way, we are welcomed by generous hospitality and friendly faces at every stop.